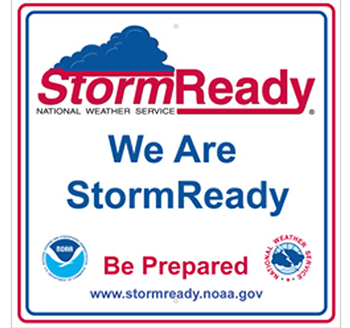 National Weather Service officials have recognized Syracuse University as a StormReady® University. The StormReady program helps university leaders and residents better prepare for hazardous weather and flooding. StormReady® Universities have made a strong commitment to implement the infrastructure and systems needed to save lives and protect property when severe weather strikes. Katherine A. Hawley, a meteorologist with the National Weather Service forecast office in Binghamton, will present Syracuse University officials with a certificate and special StormReady® sign during a ceremony Sept. 26, on campus. “This is a very important accomplishment for Syracuse University,” says David Nicosia, warning coordination meteorologist for the National Weather Service in Binghamton. “The Syracuse area has a long history of severe weather, snowstorms, floods and even a few tornadoes. Syracuse University has taken all the necessary steps to be better prepared for whatever Mother Nature has in store. The nationwide community preparedness program, founded in 1999, is a grassroots approach to preparing for natural hazards. Today, more than 2,500 U.S. communities, counties and universities are better prepared for severe weather through the StormReady program. To be recognized as StormReady®, a University must maintain a 24-hour warning point and emergency operations center; have more than one way to receive National Weather Service warnings and to alert the public; be able to monitor local weather and flood conditions; conduct preparedness programs; and ensure hazardous weather and flooding are addressed in formal emergency management plans, which include training SKYWARN® weather spotters and holding emergency exercises.